We all know that Picnik has retired just few days ago and we shared a list of other great tools to edit images online. One of the editor in that list was Pixlr and to my surprise I just found it today here in Google Drive. Yes, Pixlr is an app that can be added to your Google Drive which allows you to directly create, edit images from Google Drive and once you are done editing, you can choose to save it back in Google Drive. It has made photo editing a simpler task as your edited image will be available on all your devices on which Google Drive is configured. Click on ‘Create’ > More > and Then Choose ‘Pixlr Editor’. 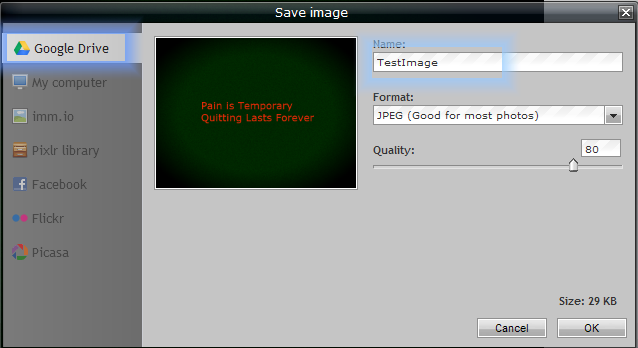 It will redirect you to pixlr online editor where you can create and edit your images. If there are pics in your Google Drive just select that image file and right click on it. In the right click menu, Go to Open With > Pixlr Editor. 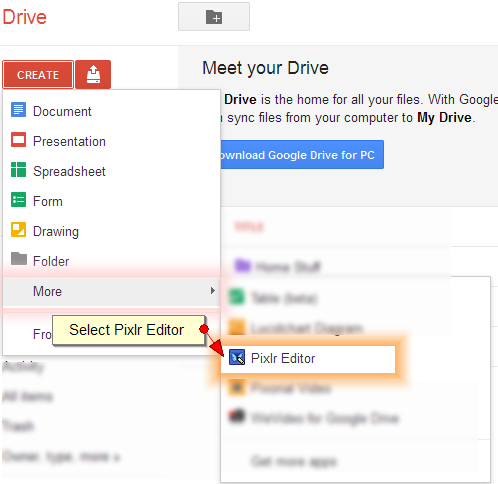 Once you have edited the image in Pixlr Online Editor, while saving you will see a new tab for Google Drive. Give a New File Name and hit ‘Ok’. Now this image in Pixlr Editor is directly saved in your Google Drive. So not only your image is stored on Web version of Google Drive but it will synched on Google Drive folder on your computer whenever the next sync happens.